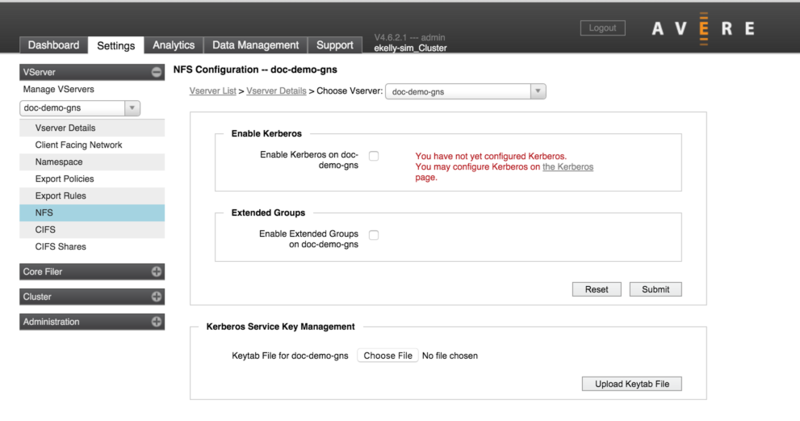 The NFS Settings page lets you enable or disable Kerberos authentication for a particular vserver, and enable extended groups. You must set up Kerberos for the cluster before you can enable it from this page. Use the Cluster > Kerberos page to configure Kerberos. (If Kerberos is not set up, there is a link to the Kerberos configuration page in the Enable Kerberos panel.) Read Setting Up Kerberos Authentication to understand the settings required to configure Kerberos for various types of cluster communication. If your cluster includes more than one vserver, first choose which vserver to configure by using the drop-down list at the top of the page or in the side menu. Check the box in the Enable Kerberos section to turn on Kerberos-based authentication for the exports controlled by this vserver. You also can enable Kerberos at the export level through a customized export rule; read Setting Up Kerberos Authentication to learn more. The Kerberos Service Key Management panel allows you to upload a keytab file for Kerberos authentication between this vserver and clients. This file is not the same as the keytab file for Kerberos authentication between the cluster and core filers; that file is uploaded on the Cluster > Kerberos page. Read Setting Up Kerberos Authentication to understand the different files and their purposes. Username download increases system overhead, so it is best to enable this feature only if needed.